I passed up this classic van this weekend from vintage TV show, the A-Team. Awesome... 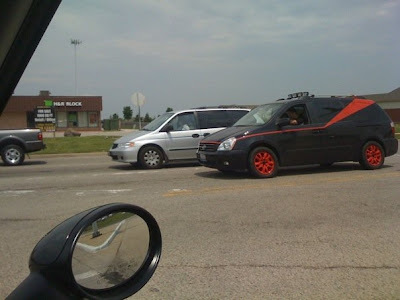 Wait a minute... that is a Kia Van!! Only in America. Respect the Van! Hope everyone enjoys their Holiday weekend! I snapped a shot of this Vdub with a pretty cool automatic spoiler. As I drove along the side of this, the spoiler would pop up at about 45mph and retract back as it slowed to about 15mph. 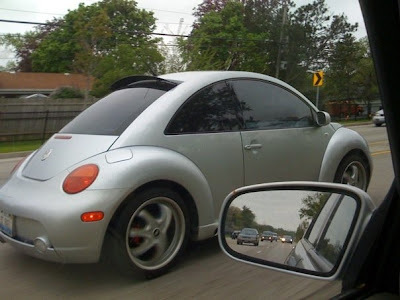 I've seen this before on the Crossfire and other cars but I never knew it was on the bug too. 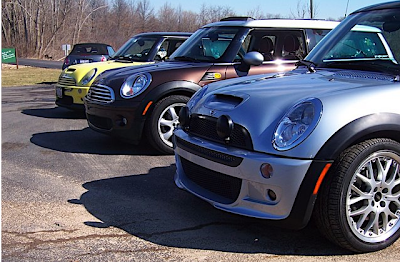 Here is an article that came across my inbox reinforcing the idea that the MINI is a great value. Consumer Reports compiled all of their resources to produce a "bucks-per-bang" for each vehicle. The Prius Touring tops the list with a bucks-per-bang figure of $325 but the MINI and VW Rabbit came in a close second. The Prius is followed closely in our list by the Mini Cooper and VW Rabbit hatchbacks, with a bucks-per- bang figure of $330. Five small cars, the Mazda Miata sports car, and the Toyota Camry Hybrid family sedan follow with results ranging from $340 to $365. One of those small cars, the redesigned Honda Fit, has the best owner cost in the list, only $24,000 over five years. Most Bang for the Buck via Yahoo.